When you think of a typical ESPN.com story, what comes to mind? Struggling to make a generalization? That’s because the preeminent sports website prides itself on being everything to everyone. Short breaking news stories, game recaps and reaction columns: check. Medium-sized personality profiles, best-of lists and opinion pieces: check. Long form, first-person articles and investigative reports: check. ESPN.com has such a range of content on its site, and such a range of reporters, bloggers and columnists that it is nearly impossible to answer the question “How well are stories written and presented?” in a universal way. So let’s answer the question in several different ways. Much of the site’s content is of the quick-hit, read-while-you-take-a-work-break variety. These are the no-frills sports game stories and analysis that readers have come to expect to read almost instantly after a game has ended. The links provided under the “headlines” section on the upper right-hand-corner of the site are typically 500- to700-word stories either from the Associated Press or written by ESPN staff writers in a manner that the Associated Press would approve of: mostly formulaic, inverted pyramid articles. These stories are written in a style that is generally easy to read and most importantly easy to skim. The stories are typically presented with a video or photo at the top of the page and the article below. ESPN.com presents even the most mundane stories in a visually interesting manner — with graphics, multimedia content and interactive elements. In a recent story about MLB agreeing to expand its playoffs, instead of including a dull picture of Bud Selig the story is packaged with a related column and a poll question. The site prominently features its reporters and bloggers by most often including their mug shot with content they produce. But don’t mistake informal, often opinionated writing with sloppy writing. ESPN.com has as few copy editing errors or poorly written stories as any online site I know. Some of my colleagues work for the site and comment on the abundance of editors at all levels. ESPN knows that its audience wants a range of content and caters to both the work reader and the person sitting at his computer on a Saturday wanting to read in-depth stories or watch videos. Which brings us back to evaluating writing quality. Many of ESPN’s longer pieces, both columns and investigative reports, run longer than the typical newspaper article (and sometimes even the typical magazine article). That’s the beauty of the web: There’s an endless amount of space. With Grantland, ESPN has proven that there’s an audience for long form sports journalism. Many readers are devoted to the site’s founder, Bill Simmons, and his 3,000-plus-word NBA essays on everything from the state of the league to who should have made the All-Star team. 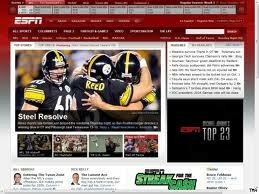 As with the shorter articles on the site, ESPN’s longer articles often keep with the informal, first-person style and often include a variety of multimedia options for readers. So while it’s hard to identify the typical ESPN.com article, it’s safe to say that many writers on the site adhere to the following principles: Get content up quickly, highlight the news but don’t be afraid to provide analysis and opinion, be informal and interact with readers in any way possible. ESPN editors appear to follow the credo: Use a mixture of video, audio, photographs and related content to make each page visually interesting and keep readers on the site for as long as possible. Check back next week for a look at the kind of stories ESPN.com covers particularly well.